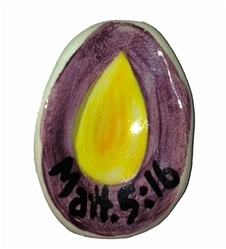 This individually hand-crafted Anniversary of Baptism Stone is made of durable glazed pottery which can last a lifetime. At about 1.5 inches, it is sized to fit in a pocket, blessing bowl, or a faith chest. Purchase one or more to gift to others as a meaningful reminder for this special moment. This stone complements the Anniversary of Baptism Milestone module and the Anniversary of Baptism Milestone moment. It is also included in the Blessing Bowl set for Congregational Milestones. The anniversary of a baptism is worthy of celebrating as it reminds us that Baptism presents God's visible word as a sacrament that gives the Holy Spirit for a lifelong journey of faith. These beautiful remembrances will keep congregations, families, and individuals rejoicing over special events long after they happen. This Anniversary of Baptism stone for gifting is a wonderful keepsake to remember the occasion and the special memories of the day.